Casper is adorable as a kitten. I love him as an adult to but I can't express how much I love him!!!!!!!!! I am jealous. Oh my gosh. How utterly sweet and adorable! GS, no apologies ever needed. We love seeing all the photos you put up regardless of the status of TDK. Casper was an adorable baby. Love the tail. MONICA!!! Casper is a doll!!! I can't get over how beautiful he is!!! I've told you a hundred times and I'm telling you again, I jus LOVE Casper! Did his eyes get bluer as he got older? He was a pretty kitten and grew into a handsome adult!!!! Thanks all for Casper comments. Kim I just LOVE Casper too. If you remember right, awhile back GS called me on my favortism of him. I think the comment was on TDK. I can't remember. Casper interacts with me more than the other cats around here, but I still love all. Just wished the picture turned out better as I cut his ears off. He wasn't an easy one to get a picture of as I'm sure you all know it's hard getting pics of kittens. I think his eyes got a darker blue as he got older. The blue doesn't show up much in this picture. I was hoping he would stay this coloring but he grew up handsome in spite of himself. Thanks so much GS for posting Baby Casper. Awww - he was such a cute little thing who grew up to such a handsome boy! Such beautiful markings and I love his tail too. I'd like to be included in Casper's fan club! 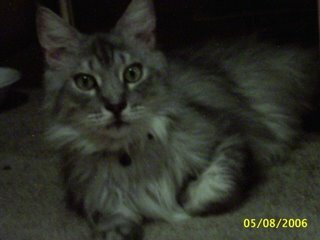 Casper was a very handsome kitten, and a very handsome big boy. I just love that look he's giving in his pic. 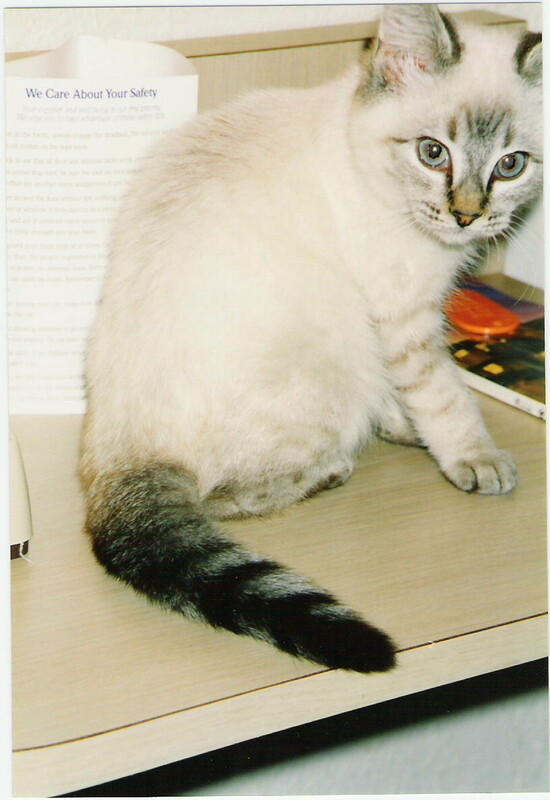 casper's mamma thanks for sharing his baby pic with us.I never really had mine when they were very little. Wow! He looks so different! Look at his little "M". As Karen said, such a cute kitten and a now handsome adult! Hi Casper! Purrs and chin scratches! GS - Did you notice I sent turtle pictures, as promised? Okay, they're not the greatest, but those turtles are awfully wiggly! My folks had a couple of turtles for awhile. They were maybe 5-6" across their shells. Mom and Dad put up a 12" or so tall wire fence to try and keep them within a certain flowerbed. One of them would repeatedly *climb* the fence, get to the top, and then teeter there (Dad saw this happen several times), until he either fell back inside the enclosure only to try again, or outside the fence for his escape! I would love to see the look on Missy Blue Eyes' face when she sees THIS picture of her heart throb. Casper was a beauty of a kitten, just as he is a very handsome gentleman cat! yeeeeees mumma, my eye is feeling better. I actually found my glasses when I got home on Friday. THEY HAD BEEN IN MY MEDICINE CABINET!!!!!!! Right in front of my face!!!!!!!!!!! I go in there all the time-never noticed. Friday evening I was nonchalantly getting ready to go see the Da Vinci Code with Bryan and a friend from work, and I open the cabinet, and *WHAM! * It practically jumps out and smacks me. My little black leather case. I was like, "SON of a B!#@%!!!!!!!" Bryan was like, "Whu...." And I was like, OK. Just say, 'hunny, I'm glad you found 'em', and I won't go crazy. And he was like, YOu found your glasses? Yeah. Where were they? In the medicine cabinet. Hunny, I'm glad you found them. Yep, thanks. AAAAAAHHHHHH! Anyhow, I went to the movies with my contacts since I see better with them (and we were going to be on the motorcycle-and if I have my glasses on, I can't wear them + the helmet, so I'd rather have my contacts), but I swore to Bryan that I would take them off as soon as I got home, which I did. And now the swelling (imaginary or not) is pretty much gone, and I feel so much better. I don't know if it was the contact, the solution or just some freak thing, but I'm feeling much better, although I'm going to keep the contacts out for the rest of the week to give the peepers a rest. GS - Post them all together if you have the room. It's not like they're really great quality pictures or anything! Donna - since these guys are water turtles, when you lift them out of the water, their little legs/fins tend to try to "swim" in the air and they refuse to pose. I have to keep a screen on top of the aquarium, weighted down by rocks, because one of them manages to pull himself up to the edge too. I'll see little turtle claws curled over the edge of the tank and a head poking over the side. He almost did fall a couple times, so now I make sure to never leave the top off. Missy Blue Eyes - where are you? Come see the picture! Karen, how funny. Turtles seem to be quite the surprising little creatures. I'm looking forward to seeing your turtles. Oh Rosie!!!!!!!!!! What can I say??????????? monica - casper truly was a handsome little boy. he is one of those kitties that only got better with age. i love his facial markings and his tail in this picture. thanks for sending in his baby pic. Oh, Casper is precious as a kitten [but of course!]. Wow. Missy is going nuts over here. I don't know how, but she KNOWS! He is so cute and grew into such a handsome fellow. I love seeing the baby pictures. I've missed everything today, got some kind of a bug. High fever, sore throat (can't talk -- arghhh). Been sleeping. Really want to thank Karen C. for helping me with info about my strays -- am so excited. ML - you're very welcome. It's so sweet of you to want to help them too. Feel better soon! I'm glad Missy got to see Casper - you should put him up as your computer wallpaper for her! ML, My gosh,I can hardly believe that Missy would know Casper in the kitten photo. Boy, you have some smart cat there. I find this so interesting. Hope you get well real real soon. It's just to yucky to feel like you do right now. Sleeping is the best thing to do. Prayers for you. Thanks again GS and all for all the nice comments. Good Night All. Awwww he is too cute! And still is.